Latch Satellite is a new module that allows the installation of a Latch server in your organization; this local implementation will vastly improve response times and it will support higher volumes of queries from any of your applications, both internal and external. Organizations can implement one or several Latch Satellites distributed in different locations, or even a multi-node deployment in a single location. It is 100% scalable and adaptable to any specific needs of volume of queries. 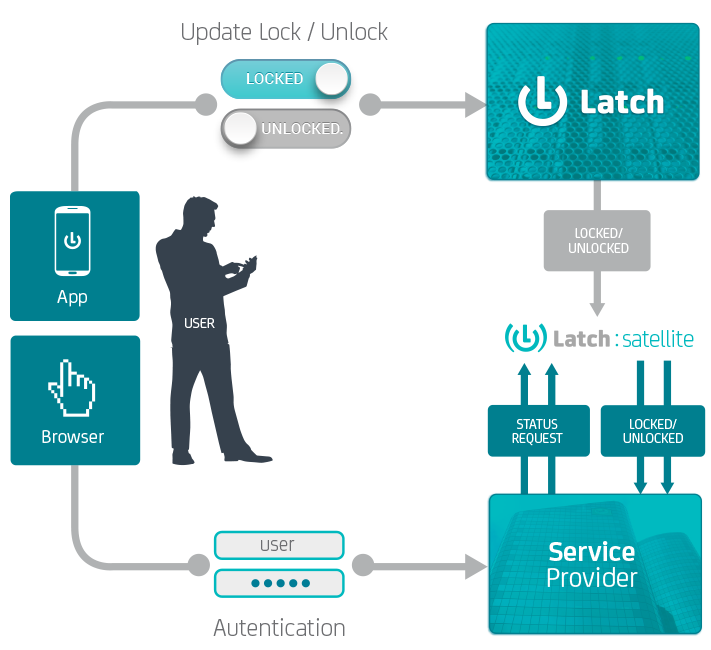 Latch Satellite protocols have been designed to maximize its efficiency, and the Satellite will always be up-to-date with any status update from any Latch user. These protocols also offer high availability and disaster recovery features, in the case of a network error or any other communications problem. You can also manage several Latch applications from the same Latch Satellite, reducing response times for any or all of your applications inside your internal network. Latch synchronous protocols offer a real time solution, without extra modules or changes in your application's flow that easily integrates in your organization. Latch is globally deployed and your users will be able to rapidly and securely check the status of any of their latches in any authentication or authorization scenario. Latch can handle a huge volume of queries and offer extremely low response times, but it still is a SaaS-based and response time from the Latch servers will be always higher (tenths of a second) than from your own internal network (milliseconds). In the authentication scenario, response times are totally insignificant from the user point of view. However, your servers could struggle with thousands or millions of authentication requests, waiting for responses from our SaaS-based Latch servers. In the authorization scenario where you want to manage both the login and the user session, it would require an external query to our SaaS-based Latch servers for every user action on your application. It is highly likely that your servers would be affected with all the traffic. Both scenarios are good examples of when to use Latch Satellite. Latch Satellite can boost your response times and support a huge volume of queries. Your users will enjoy a placid user experience and a smooth interaction with your applications. Would you like to try a pilot?